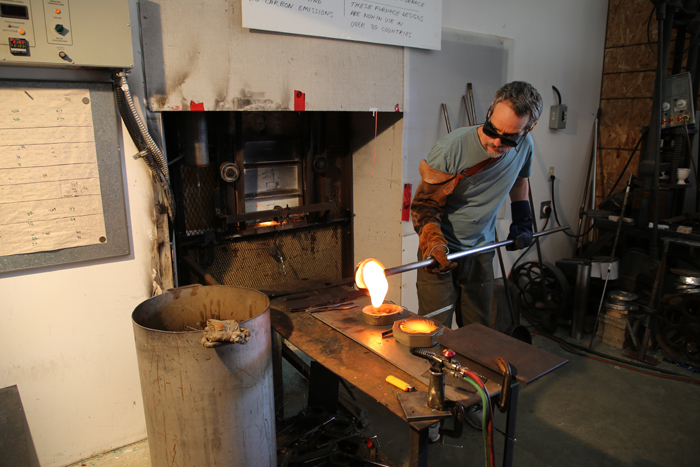 Mark Lauckner pours melted, repurposed window glass into molds to create art pieces at The Glass Foundry. Sometime last week on Salt Spring, artist Mark Lauckner would have melted his 250,000th pound of scrap window glass at The Glass Foundry and transformed it into his iconic coastal giftware. Lowering the environmental footprint of a wasteful industry has been a preoccupation ever since Lauckner first started making glass work in the early 1990s. A quarter-million pounds of glass that would otherwise have gone into landfills has now been made into beautiful items like starfish, seahorses and slugs. Lauckner has succeeded admirably at changing a resource-heavy craft into one that has a positive impact. He has done this not just by diverting hundreds of tons of material from waste but through creating and promoting an energy-efficient furnace that glass artists are replicating free of charge all over the world. Lauckner lived on Mayne Island for 30 years before moving to Salt Spring with his family around five years ago. He is now finishing up his 24th-annual firing cycle, which typically takes place from October through March and sees him keeping the furnace hot for 10 days or more, per month, during that period. Glass Foundry blown and cast glass giftware objects are a now familiar sight at island shops and galleries that focus on local crafts. Lauckner’s recycled glass giftware can be found at more than 75 shops. Unique art glass is sold at his home gallery, which is part of the Salt Spring Studio Tour. He also produces speciality items such as the Salt Spring Chamber of Commerce “Salty” award trophies, and makes souvenir castings of wolf paws for the Northern Lights Wolf Centre in Golden. At the moment the foundry produces 30 different objects in 12 different colours, amounting to 10,000 items a year. The design menu is fairly consistent because, Lauckner explains, he doesn’t have time to add anything to the line. “If I make something new I have to discontinue something,” he said, noting one of his newest molds dates back to 2012. All of that finished product requires a lot of base material, and Lauckner goes through 5,440 kilos (12,000 pounds or six tons) of glass each winter. He said most professional glass blowers will not work with recycled glass because it’s imperfect and bubbly, but he has stuck to the process throughout. The furnace that melts Lauckner’s glass uses an eighth to a tenth of the energy of a regular glass furnace. He wanted to move away from the traditional gas-powered model almost immediately after starting the craft and soon developed his own design, improving things over four previous prototypes before arriving at the current electric model. It has no combustion and therefore no carbon emissions, and can melt 90 kg (200 lb) of glass a day. Based on Lauckner’s workload, that’s 16,330 kg (36,000 lb) of CO2 that has not entered the atmosphere each year.